I thought this was a series, and then of course once I’d received it I realised it was the final part in a trilogy – and I haven’t read parts one and two. My bad! Anyway I read the amazon samples of them, which gave me enough for understand the story. Its not just a story, something to amuse, to while away a few hours, a historical tale, but is an amazing and unusual read grounded in the harsh realities of the time, peppered with a fabulous and disparate bunch of characters. 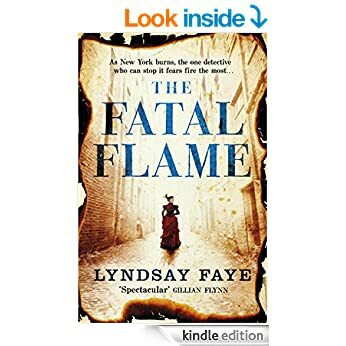 It’s a wonderful read, set back in 1840’s USA, where life is one long, harsh struggle for most people, and if you’re female, Irish or coloured you’ve little or no rights. In among all the poverty, crime and darkness is Timothy, a Copper Star, whose such a wonderful character. To me he feels like that one candle that lights up the darkness, he’s such a genuine, hardworking, loving, kind and moral man who empathises and tries his best to help people – not just those he loves but many others. I felt his love for Mercy, and the paradox she posed to him – I so much wanted him to be happy and find love. He’s intelligent, and along with his brother Valentine ( oh he’s great too!) he’s trying to find a way to live, to love and to help others. Sometimes I feel he’s an idealist but with roots grounded in reality, and knows realistically there’s only so much can be done. Valentine seems like the charmed man, loved by many and always living life on the edge, but at his heart a true idealist. His lover ( one of) Jim, is a great character and friend to Timothy. The two brothers are all that remains of their family, and look out for each other. I loved all the characters here, they’re so much more than simple words on a page, and along with the scenes depicted, the harshness and poverty, the desperation I could feel from those at the bottom, the smugness of those living at the top of the pile made for a really satisfying and unusual read. I love to feel “in” a novel and here I was on the edge of my seat, holding my breath, worrying and wondering what would come next. I hope I’ve understood the characters correctly but of course there’s so much gone earlier that I may have got things wrong – its how they feel to me though from this read. There’s a clear mystery for Timothy to solve, that once again brings him and those he loves into danger. Parts of the story seem to move along slowly, and then suddenly you realise just how far from the start it’s gone, and how other interludes have left clues that need to be woven in. Its not a story of multi but separate plots, but ones that feel individual until gradually you can see the links that connect them cleverly woven in. I never could work how who was behind things, nor why or even how, and the revelation was just that for me – a complete unthought of of scene. Its got a perfect ending too, and one that made me feel very emotional, its very bittersweet and I was on the edge of tears. Thankfully there’s a glossary of terms – the Flash speech – at the beginning, or I’d have been stuck. sometimes its easy to work out from context, and sometimes you need that extra help. I loved the book, but feel if I’d read books one and two and got really invested and understood the characters properly and what moved them then I’d have got even more. Its still a five star read from me though.